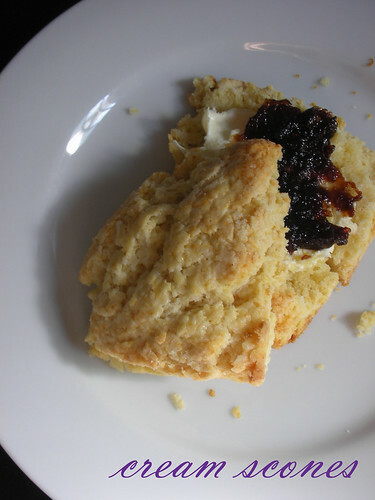 It’s steamy hot out…hot and gross…but these Cream Scones were sooo worth turning the oven on for. Butter and cream…they are a combo to be reckoned with. I don’t know how two things that are so rich can make something that is so light, crumbly and almost melt-in-your-mouth, but there you have it. I’ll be making these again when it’s cooler out and I can stand a proper cuppa to go along with them. After many attempts at scones and biscuits that wound up looking annoyingly like pancakes (sad! ), I think that with my last few batches, I’ve finally gotten it down. I already told you all this stuff with the last one, but….now I grate my cold butter, and then pop it into the freezer while I assemble my dry ingredients. Then I just give a quick, fingertippy toss of the butter and dry stuff. I find that this way, I don’t have to do as much rubbing and working to get the two incorporated. Also, I pat the scones out a little fatter than Dorie says to ensure a tall rise (which I don’t think the angle on this photo shows, but I assure you, they were nice and high). Of course I get one or two fewer scones per batch, but that’s fine by me. I skipped the currants here (I didn’t have any), but they aren’t really necessary anyway…especially when there’s jam. Also not strictly necessary (but crazy delicious! ), one of my favorite things about British-style tea service is the thick cream you spread on along with jam. I found some of that Luxury Clotted Cream in a local shop, and shelled out for it in anticipation of these guys. For the recipe, see Baking: From My Home to Yours by Dorie Greenspan or read Cafe Lynnylu, as it was Patricia’s pick this week. Don’t forget to check out the TWD Blogroll! These were so good and I bet they were especially good with clotted cream! I used a cranberry orange butter in mine and that was just perfect. Wow, clotted cream! Yum! Your scones look divine. Thanks for baking with me. Great idea on grating the frozen butter! Love clotted cream on scones. with jam. find mine at WF but usually at World Market. Scones look great. Glad you got them down now. Good to know I can find it at World Market. Scones with jam and clotted cream – what could be better, even when it’s hot outside?